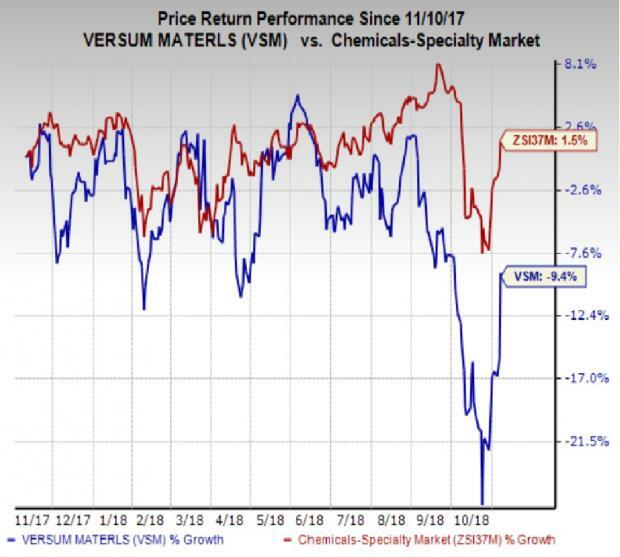 Versum Materials, Inc. VSM recorded profit of $53.9 million or 49 cents per share in fourth-quarter fiscal 2018 (ended Sep 30, 2018), up roughly 20% from $45.1 million or 41 cents a year ago. Barring one-time items, adjusted earnings came in at 60 cents per share, which beat the Zacks Consensus Estimate of 57 cents. Sales rose around 19% year over year to $350.8 million for the quarter, mainly driven by strong volume gains in Materials and Delivery Systems & Services (DS&S) segments. The figure also topped the Zacks Consensus Estimate of $323.2 million. Profit for fiscal 2018 was $197.5 million or $1.80 per share, up roughly 2% from $193.3 million or $1.77 per share a year ago. Sales rose around 22% year over year to $1,372.3 million for fiscal 2018. Revenues at the Materials segment rose 8% year over year to $233.6 million in the reported quarter, driven by strong volume gains in Advanced Materials and Process Materials. Sales at the DS&S unit jumped 52% year over year to $116.6 million in the quarter on the back of continued strong growth in equipment and installation project. Versum Materials ended fiscal 2018 with cash and cash equivalents of $399.8 million, up around 47% year over year. Long-term debt was $974.2 million, essentially flat year over year. For fiscal 2019, the company sees sales in the range of $1,425-$1,475 million and adjusted EBITDA of between $475 million and $495 million. The company is optimistic about the prospects for semiconductor materials over the long term and envisions another year of strong growth in fiscal 2019. It has a number of organic growth opportunities that are expected to deliver outstanding returns for its customers and shareholders. Versum Materials also noted that it has entered fiscal 2019 with a strong equipment order book and expects its equipment business to outperform the underlying market. Shares of Versum Materials have lost 9.4% over a year against the industry’s 1.5% rise.